The more potassium to a fruit or flower, the fatter the fruit of flower! For the largest volume increase, twice the potassium than phosphorus!! In the Metrop MR2 flower fertilizer, the NPK and micro-elements balance is specially composed to produce the highest possible yield from the plant. The raw materials of Metrop MR2 bloom fertilizer is of very high purity, which makes it possible to achieve a high NPK proportion without disturbing the plant. 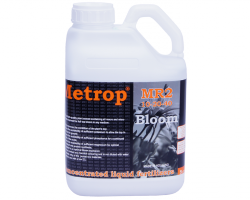 Metrop MR2 flower fertilizer is a high-quality plant extract containing all macro and micro nutrients required for full top bloom in any medium.
. Does not contain any harmful colouring and is not diluted with water: it consists only of the purest raw materials. From the 3rd or 4th week of the bloom, depending on the top size, give in gradually increasing doses until the end. In the last week, rinse as needed. If the soil is nutrient-rich, give this mixture 1 to 3x per week. Give daily if the soil is nutrient-poor or if you use hydroponic growth methods. Water every day as needed. Be careful not to overdose. This product should be stored in a dark, frost-free place. In the event of eye contact in concentrated form, rinse eyes immediately with water. Metrop MR2 flower fertilizer is biologically degradable.